School supplies like scissors, compasses, even binders, all have the potential for injury. But have you ever heard of someone hurting themselves with a pencil sharpener? 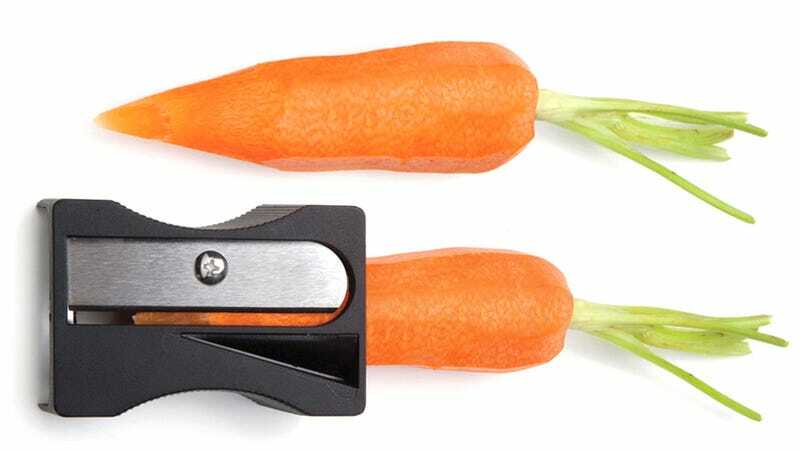 Probably not, which is why this Karoto carrot/cucumber/other elongated vegetable peeler is a stroke of genius. It's essentially nothing more than the sharpener you used to hone your colored pencils back in grade school, but scaled up considerably so it can handle foods. All it takes is a few twists to produce a lovely garnish for a salad or other dishes. And since your hands and fingers are kept well clear of the blade while using it, you'd have to be really trying hard to injure yourself with this thing. So for $15, you'll be saving yourself a small fortune in bandaids.